Sant Jarnail Singh Bhindrenwale was a (and to some extent still is ) Sikh hero of modern times. He was born in the family of Brar-Jatt Baba Joginder Singh and Mata Nihal Kaur of the village Rode in Faridkot District. Baba Joginder Singh was a farmer of moderate means. Bhindrenwale was youngest of the seven brothers. After primary education took up farming in his village. He engaged himself in farming until 1965 when he joined the Damdami Taksal of Bhinder Kalan village, about 15 km north of Moga, then headed by Sant Gurbachan Singh Khalsa. Hence the epithet Bhindrenwale. But his association with Bhinder village was only notional because Sant Gurbachan Singh, though associated with Gurdwara Akhand Prakash at Bhinder Kalan, usually took out his group of pupils on prolonged tours. Jarnail Singh underwent a one-year course in scriptural, theological and historical studies, at the hands of Sant Gurbachan Singh Khalsa partly during one of his tours but for the most part during his stay at Gurdwara Sis Asthan Patshahi IX, near Nabha Sahib village, 15 km south of Chandigarh along the Chandigarh-Patiala road. In 1966, he rejoined his Family and settled down to farming again. He was married in 1966 to Bibi Pritam Kaur, daughter of Bhai Sucha Singh of Bilaspur, and had two sons, Ishar Singh and Inderjit Singh, born in 1971 and 1975 respectively. He continued his religious studies and also kept his close association with the Taksal, which after the death of Sant Gurbachan Singh Khalsa, in June 1969, was headed by Sant Kartar Singh Khalsa, who established his headquarters at Gurdwara Gurdarshan Prakash at Mehta Chowk, 25 km northeast of Amritsar along the road to Sri Hargobindpur. Sant Kartar Singh khalsa was killed in a road accident. Before his deadh on 16 August 1977, he had mentioned the name of Sant Jarnail Singh as his successor as the new head of Damdami Taksal. 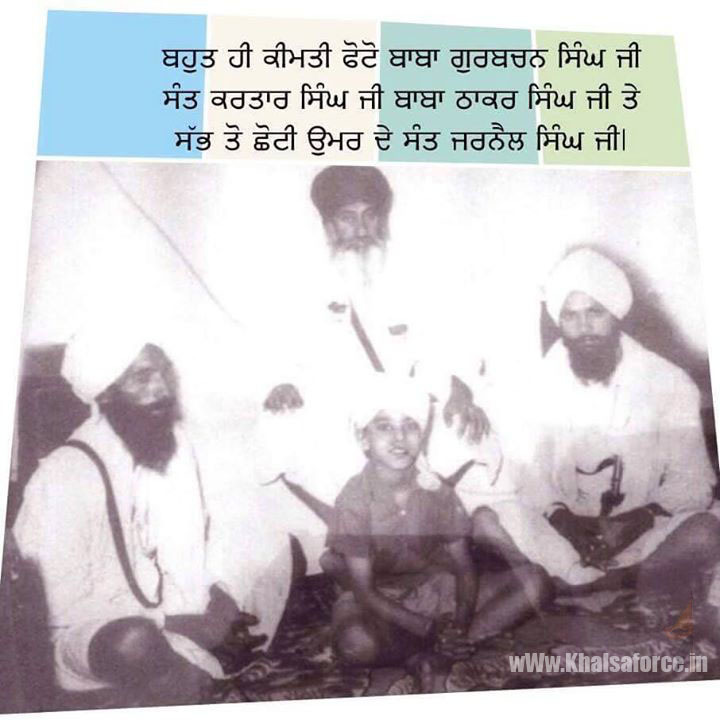 Sant Jarnail Singh was formally, elected at the bhog ceremony in honour of Sant Kartar Singh Khalsa at Mehta Chowk on 25 August 1977. Sant Jarnail Singh Bhindranwale extensively toured cities and villages of Punjab to preach the Sikh faith. He also visited other states and cities in India. Wherever he went, he carried Siri Guru Gobind Singh Sahib’s message to every home exhorting Sikhs to take Amrit, observe the Sikh appearance, and live according to the teachings of Siri Guru Granth Sahib. As Tavleen Singh tells us: ‘His philosophy in six words was Nashey chaddo, Amrit chhako, Gursikh bano (Give up addictions, Take Amrit, Bec ome good Sikhs)’. Explaining his mission, he said: ‘My mission is to administer Amrit, to explain the meanings of Gurbani and to teach Gurbani to those around me; … and (to tell people) that a Hindu should be a firm Hindu, a Muslim should be a firm Muslim, and a Sikh should be a firm Sikh’. His preaching was based on love. He said: ‘If we speak to someone with hatred and try to assert our superiority, it will create hatred in the minds of everyone. So long as we have the spirit of love, so long as we have the support of Satguru Hargobind Sahib, the Master of Miri and Piri, is there any power on earth that can subdue us?’ He wanted the Sikhs to ‘come back to Anandpur, their home’ by taking Amrit, and become his brothers and sons of Siri Guru Gobind Singh Sahib. Sant Bhindranwale had a charismatic personality and spoke in simple village idiom. Those who listened to him, were impressed by his simple living, personal charm, and clear thinking. Joyce Pettigrew, who met him in 1980, writes: ‘There was a very close association between the Sant and the people, as I myself witnessed on a visit to meet Sant Bhindranwale in Guru Nanak Niwas.’ According to Shiva, Sant Jarnail Singh Bhindranwale ‘gained his popularity with the Punjab peasantry by launching an ideological crusade against the cultural corruption of Punjab. The most ardent followers of Bhindranwale in his first phase of rising popularity were children and women, both because they were relatively free of the new culture of degenerative consumption, and they were worst hit by the violence it generated. In the second phase of Bhindranwale’s popularity, men also joined his following, replacing vulgar movies with visits to gurdwaras, and reading the ‘gurbani’ in place of pornographic literature.